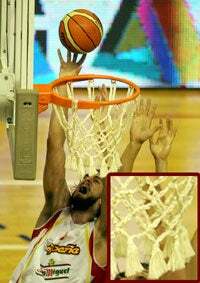 Need4Sheed points out that while looking through pictures of last week's international basketball game between Spain and China, the nets on the baskets appeared to be macrame. We find this a trend in sports that we could potentially get behind; particularly well constructed, almost artistically so, equipment and constructions. We would love to see a crocheted soccer net, for example. Or maybe a particularly well-painted, Dada-esque team logo at the 50-yard line. Maybe some nifty etchings in a bat. We dunno: Has to be something. Because all we know is that net looks like one of our great aunt's wigs. Do they hire someone specifically to do that? We hope that's not intern work.